Michelle P Brown. 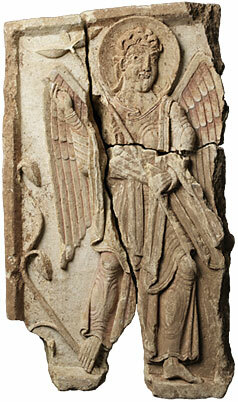 (2007) “The Lichfield Angel and the Manuscript Context: Lichfield as a Centre of Insular Art” Journal of the British Archaeological Association. 160(1): 8-19. I thought that I would share some of this since I imagine many people are as eager to hear more about the Lichfield Angel as I am. 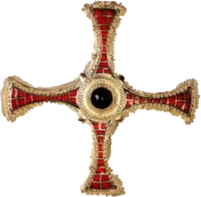 Here is a picture of it from the Lichfield Cathedral website. Here is a link to the Angel Project Site with all kinds of info on its conservation etc. including a reconstruction of its paint. The angel is on a limestone slab that was the corner of a structure, probably a house shrine similar to the St Andrew’s shrine in Pictland. It is 2.5 ft high and has traces of pigment left. The Litchfield Cathedral refers to a palate of white, red and black outlines, but Michelle Brown asserts that the colors are white, purple, and black outlines. The reconstruction shows that the angels clothing and the outline of the nimbus were gold leaf. I strongly recommend the reconstruction link above (which looks rather red to me, though red and purple can be a fine distinction). Its quite handsome when the reconstruction is complete. Michelle Brown suggests that the drilled eyes once held glass inserts. It is believed that the angel is one half of an Annunciation scene on the shrine of St. Chad. The Lichfield Cathedral has been devoted to St. Mary since the time of Bede. The Lichfield Angel has been dated to c. 800 (775-825), around the time that Lichfield Cathedral was the seat of a third Archbishop for England. The cathedral was heavily patronized by Offa of Merica (787-802), who created his own archbishop, and by his successor Coenwulf. In Coenwulf’s time, Lichfield was demoted to the status of a regular bishop to please the pope who wanted Canterbury to retain its historic domain, but he offset this demotion with further patronage. What she is basically arguing is that the styles of the Lichfield Gospel, the Lichfield Angel and the Book of Cerne (Prayer Book of Aethelwald) all belong to the same cultural context. She is basing a lot of this on the color and design of the angels wings. 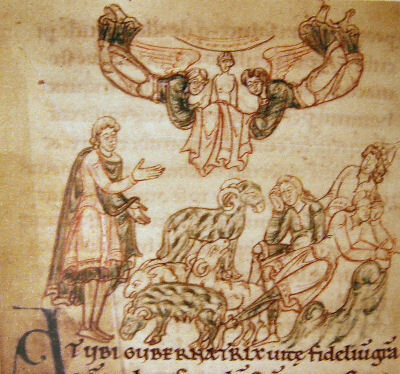 Well, I just happened to check out Michelle Brown’s book on the Book of Cerne (1996) from the library yesterday and it has full color plates of the four evangelists. From the photos the palate looks like reddish-brown, blue, gold and white. The first thing that struck me about the miniatures in the Book of Cerne is the red-white-blue palate and the eagle has an ‘early Amercian’ style (that I remember from my parents 1960s decor). Stick a couple arrows and olive branches in its talons instead of a book, and it would look like the eagle seal. Quite a patriotic looking bird with its red and white striped wings, but I diverge from medieval programming. So anyway, these wings don’t remind me that much of the Lichfield Angel… for one thing the wings in the book of Cerne have a scalloped upper edge and again the lower part of the wings are stripped in alternating red/purple and white. The tops of the wings that are most like the Lichfield Angel also match the plumage on the body of the eagle. The most striking aspect of the evangelist miniatures is that they are beardless, but they don’t have the massive firm jaw of the angel. One of the more remarkable things about the Lichfield Angel above is the anatomic definition with gold clothing that almost looks more like armor. Brown suggests (p. 15) that the Lichfield Angel is “of the highest order”, perhaps Michael but the paradise plant and intimate gestures are more common in Annunciation scenes. Like the evangelist symbols from the Book of Kells (shown in plates of her 1996 book), all of the symbols in Cerne are winged (Mark to the left). So I think this makes comparison of the winged man symbol for Matthew important. Here there seems to me to be a very different more fluid style. The wings have the small feathers at the top, as the Lichfield Angel does, but the entire wing is more fluid, less rigid. The upper margin is scalloped and the coloration is red/purple, blue,white and gold, in a rather random mixture. The body of the man/angel symbol is also more fluid and less antomical. The legs are visible lines through the clothing but crudely and the body has the hour-glass shape found in many Irish products. The wings on the lion of Mark to the left are similar to the angel sculpture with softer angles, but differ from the Matthew man/angel and the eagle wings of John in lack the scalloped upper edge. The coloration is more like the Matthew angel in its palate and randomness. 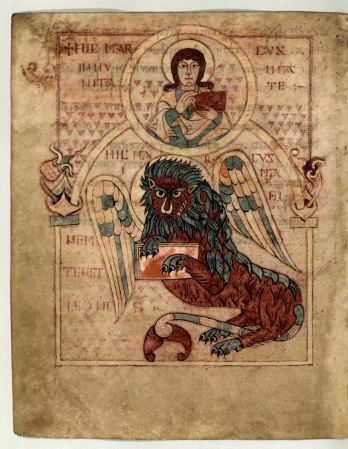 Lichfield Gospels – mid 8th century, perhaps for the refurbishment of St Chad’s shrine (as the Lindisfarne Gospels were made for St Cuthbert’s shrine). This book she admits may have been commissioned by Lichfield from somewhere else, possibly Northumbria. Lichfield Angel – c 800 during the expansion of the cathedral probably under Offa. I would be interested to hear what others who know more about these texts or have least least seen them in person think of her cluster. The angel looks less rigid than the Mercian sculptures at Bredon but is clearly an echo of the Gospel Book- consider the staff with its flowering tip, which in the Gospel Book is considered to have Coptic antecedants. So I wonder if the Angel could be as early as ca 740? I am sure Michelle Brown is right about the textual precedence. Bede has a passage, doesn’t he, about the vivid paintings at Wearmouth-Jarrow ? These too might have been an inspiration. As to giving the Gospels a ca. AD 550 date(!) and independent Welsh provenance, consider how undeveloped is the classicism of the Canterbury Gospels (arrived 597) or the primitivity of the Cathach…and you will soon appreciate that this idea can’t be right! It helps though to have seen them in the flesh, though, and that was a privilege indeed!